Jonathan thinks getting dressed is highly overrated. Besides, who wants to take off warm flannel jammies when it's so cold out? For once, today he's using the train table for its intended purpose, too. He's actually doing a much better job of keeping it all together on there than he did before. 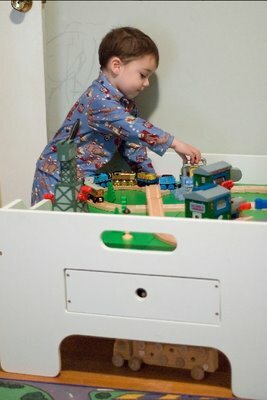 Before, I'd find him trying to rearrange the track all the time, and it would end up everywhere. Today, he even put the little trees out himself, and he's been enjoying washing all the trains. If only he could understand why you just can't run a train with 4 engines, 2 passenger cars, a tender, and 2 cargo cars smoothly on such a small track. I bet he was inspired by his visit to the "Train Man" with Ma-ma and Grandaddy. I heard they had a lot of fun!!!! Who would want to take off such cool pj's. I wonder who would give him such a wonderful thing. We miss you guys! But will see you soon. That is the coolest kid in the world. A little strange but awesome!